Not long after doing my first couple of runs in the New Balance MT101 trail shoe, and being blown away by how such a light shoe still felt so solid, I decided to go a bit lighter on my next pair of road shoes. Now, for years when I've walked into running stores, salespeople have immediately steered me toward stability shoes - I'm 6'4" and my weight has often hovered around 200 lbs. Since my weight is a little less these days, and the last pair of shoes I bought (the Brooks Defyance) weren't as stability-oriented and have been working fine, I decided to try out a pair of shoes I've been hearing a lot about - the Saucony Kinvara. To my eye, which was used to a beefier shoe, it didn't seem like there was much to the Kinvaras. The sole material seemed foamy, and the upper felt light and floppy. I was skeptical as I laced them up and got ready to run. As with the MT101s, though, I shouldn't have worried. The only thing I notices about them was that they were light. I've now got just under 100 miles on them, and have not noticed any problems, with control or stability, mechanical problems, or anything. Basically: these feel like shoes should - but lighter. It's a great feeling. One thing I've noticed is the red sole on the model that I have makes a funny mark on the inside of the shoe, if I happen to bump the side during a step. 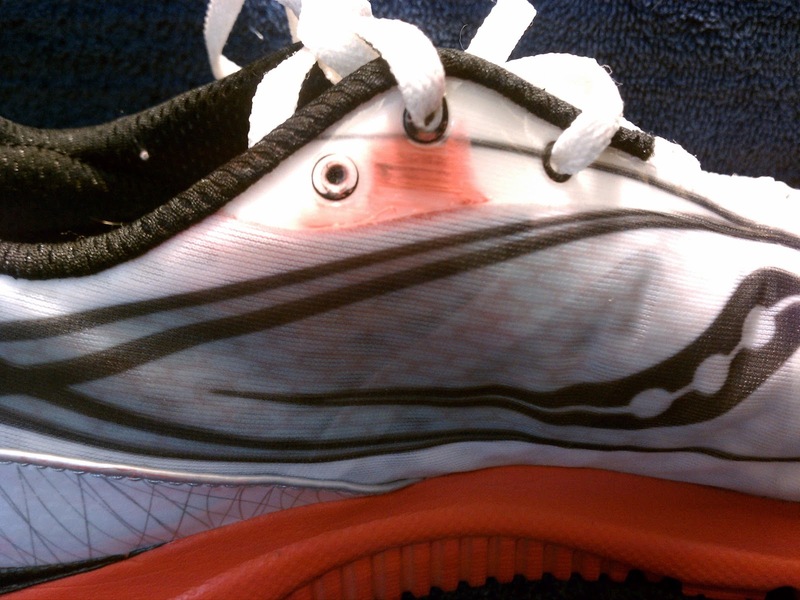 Probably means I should pay more attention to that part of my stride. Otherwise, the upper has worn well since I've had them. The sole does look like it won't last quite as long as some of my other shoes, but not substantially so. All in all, I'm really impressed with this shoe, and will probably try to get my hands on a pair of the Kinvara 2 when they come out later this year. It'll probably be time to retire these by then. 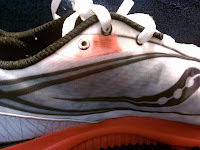 Turi, don't forget -- you're running faster than ever with the lighter shoes.